It took several minutes to power up and start loading apps, and then around 20 minutes, if not longer, to be fully responsive—this despite 16GB of RAM. My late-2011 MacBook Air, with just 4GB, restarts and is available within a couple minutes. What gives? I had to figure it out, because I increasingly found myself wasting time and waiting. You’d think someone writing the Mac 911 column would have plenty of ideas, and yes, I did. Restarting would often free up 20 to 40GB of disk space on the mini’s internal 500GB hard drive. (See this Mac 911 column for more about caches.) But the Mac wasn’t any faster after a restart than before. 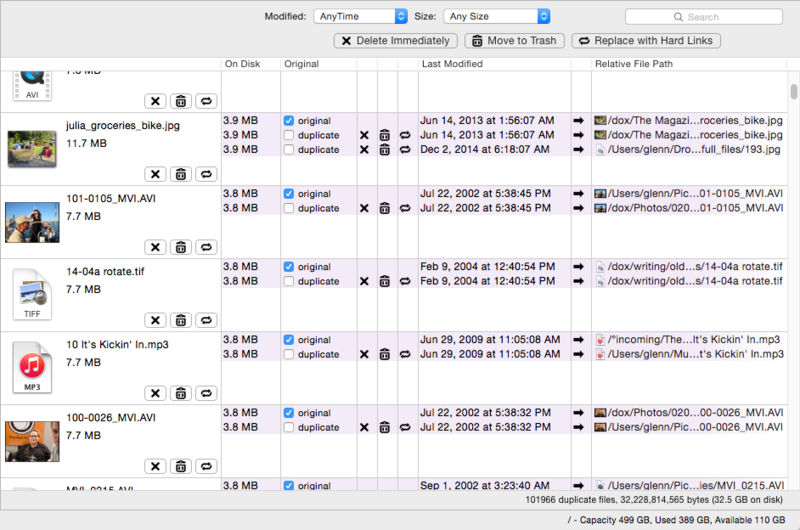 I used WhatSize (which I also reviewed) to free up almost 90GB in unneeded files, which seems to help a little. There was clearly something to do with temporary files and available disk storage slowing things down. 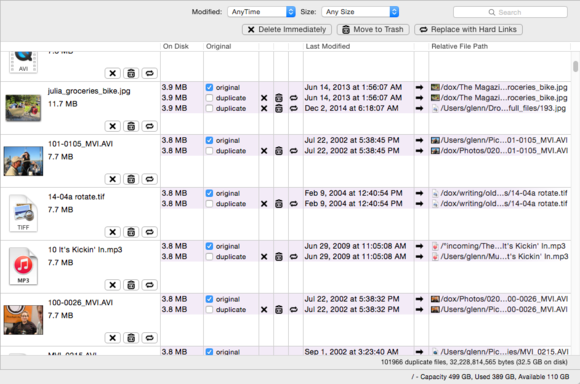 WhatSize let me quickly locate and delete 90GB of files I didn't need. That helped, but didn't fix the problem all the way. Using Activity Monitor, and in the Terminal, the top command, I could see I was often running up against the limits of physical memory, but the Mac didn’t seem to be under “memory pressure,” which would cause a lot of disk activity. During the slow post-restart, pre-usable phase, neither memory nor disk storage was an issue. Mavericks added memory compression, a way to maximize physically installed RAM that gave new life to my MacBook Air. But neither that nor swap, in which hard disk space is used to store inactive elements of memory, was causing problems as well, according to Activity Monitor. And I didn’t have an easy path to the obvious solution: swapping in an SSD, a solid-state drive that could be orders of magnitude faster than the 5400 rpm hard drive in the mini. The last few years of mini models have hard drives locked away like an idol in the Temple of Doom. iFixit ranks the swap-out as “moderate,” even though it has 20 steps in each direction. I usually don’t quail at disassembling a Mac, but this had too many chances to go wrong. 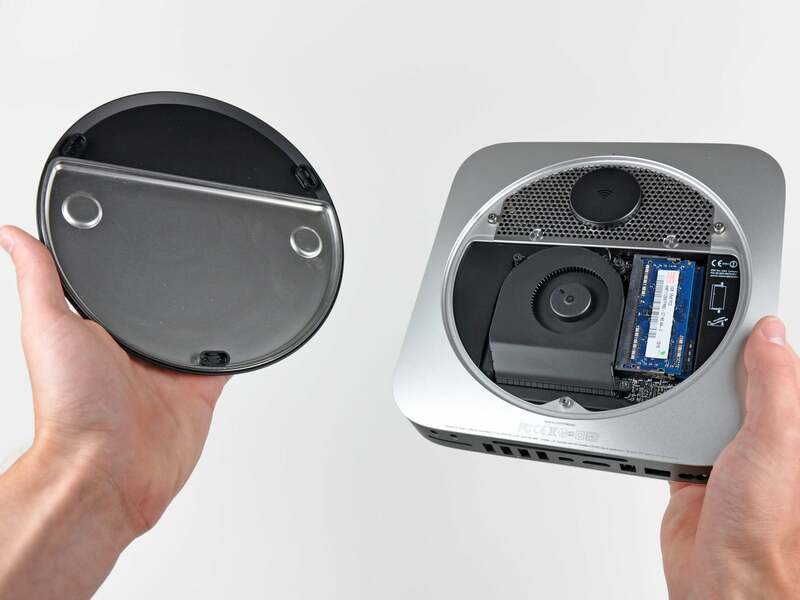 Once you crack open the Mac mini, you're still 19 steps from swapping out the hard drive. Not as easy as plugging in an external SSD. But it is, of course, possible to use an SSD in an external enclosure. I went that route, and solved the slowdowns. 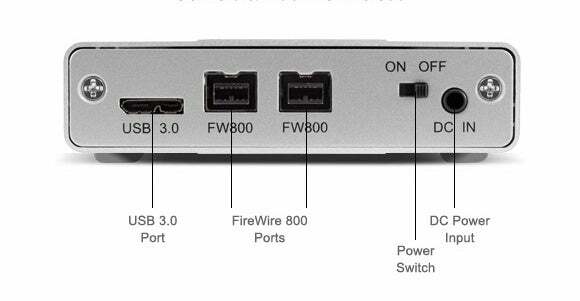 The SSD I chose has FireWire 800 to provide a fast-enough connection to my Mac mini, plus USB 3.0, so I can use it with the next Mac I buy. When the drive arrived, I had to swap some FireWire cables, as I already have another OWC drive attached for backups. I use CrashPlan for incremental and archival backups, and SuperDuper for nightly “smart” clone updates, but I turned to Carbon Copy Cloner for making my migration due to a special feature it possesses. 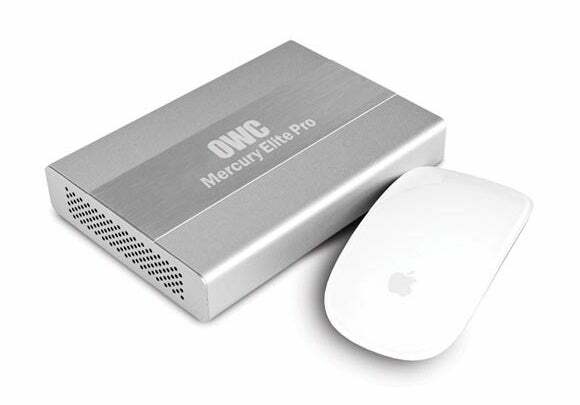 Using Carbon Copy Cloner, I copied my active startup drive in the Mac mini to the external SSD. I needed to keep working during part of the operation, but it fortunately didn’t slow the system down much. The copying rate was roughly 40GB per hour, which is fairly slow, but not unexpected. Because I was using my computer during the clone, I know I missed some changed data. Both SuperDuper and CCC have an incremental clone operation, where only changed files are copied. After the first clone was completed, I quit all active programs and shut down several services, and did another pass. This one took only about 40 minutes to complete. I used CCC’s Recovery HD feature, which lets me copy the recovery partition on an existing disk and then restore it to a new partition after a bootable system is installed. 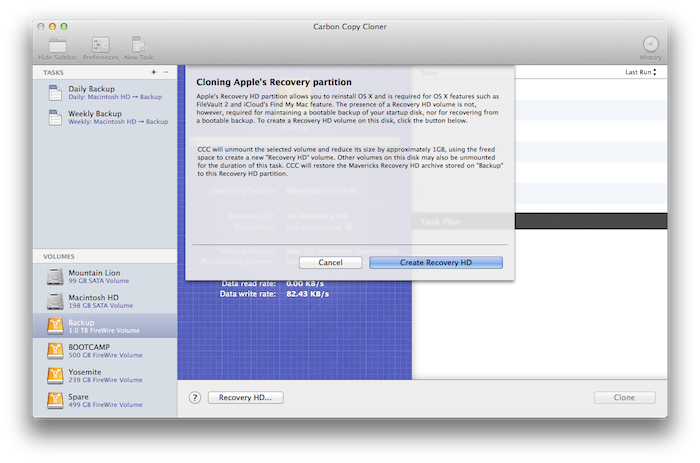 Carbon Copy Cloner can create the same Recovery partition that my Mac's internal drive has. I renamed the startup volume to a different name, and renamed the external SSD exactly as the startup disk was originally named. Then in the Startup Disk preference pane, I set the SSD as the boot volume and restarted. After the restart, I had to reconnect to a few services, like Dropbox, which cleverly notes differences in a computer’s setup to be sure that someone isn’t hijacking your system. I also had to reconnect the CrashPlan backup, by “adopting” a backup from “another computer,” a technique it uses for a new machine or a new startup identity. Everything else worked without any fuss. I immediately saw an enormous difference, as if I’d swapped the computer rather than the startup disk. The FireWire 800 bus is clearly fast enough to make the difference for the kind of reading and writing that was occurring. Restarting the first time, in which OS X was clearly engaged in some cleanup and caching, took about six minutes. Subsequent restarts are in the two- to three-minute range. The oddest thing I’ve discovered a few days in is that I’m seeing less use of memory. The maximum tops out at just above 11GB, when it used to approach 15GB or more. This is inexplicable and counter-intuitive. Why would faster storage result in more unused RAM? After I was sure I had a clean backup of my boot drive, I changed SuperDuper to backup the SSD to the Mac mini’s internal drive. In a pinch, should the SSD or its enclosure fail, I can boot off that internal drive with zero fuss—though I’d be back to the old, slow speed until I got the SSD fixed. When I’m ready to upgrade my Mac next, whether to an iMac with Retina 5K or a next-generation mini, I’ve got a portable solution: I can buy a Mac with a cheaper hard drive or Fusion drive, and leverage this purchase over USB 3.0 to start out as zippy as possible.